An individual’s home is the most important and valuable possession bought or sold by most people, yet many people are simply willing to trust anyone who has a license to buy or sell their homes. There should be more thought behind this life altering decision. Whether we like to acknowledge it or not, it’s simply a fact that many real estate professionals have never taken any type of negotiations training. They simply go out and learn on the job. RENI(Real Estate Negotiation Institute) is the first and leading national negotiation designation training company in the real estate space in North America. Less than 2,000 Realtors hold the Master Certified Negotiation Expert (MCNE) designation, representing an exclusive certification held by less than .2% of all the Realtors in the US (1.23 Million licensed as of September 2016). This is a 3 stage training and certification program that is RENI’s highest designation, representing serious commitment of time and money to benefit all our clients. 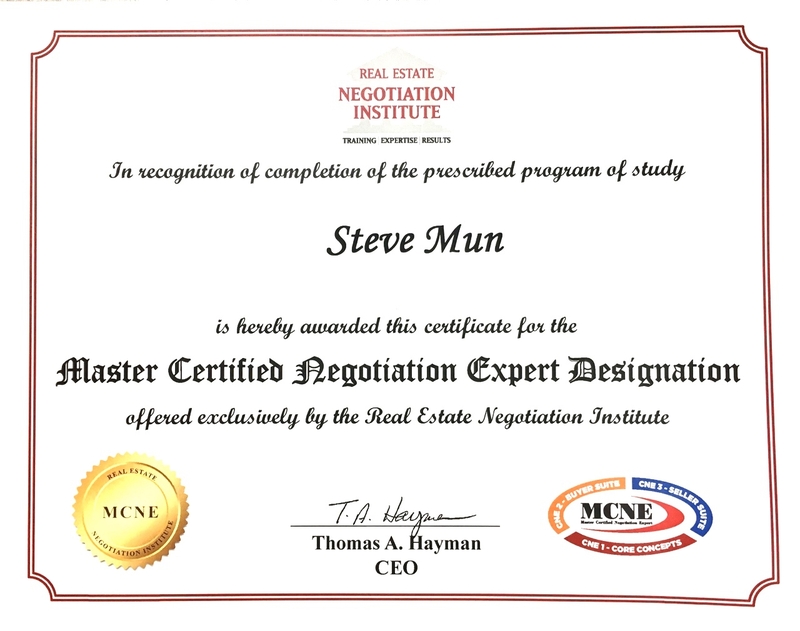 Continued pursuit of education and knowledge like the MCNE certification, combined with nearly two decades of full time experience selling homes permits Steve Mun to repeatedly bring tremendous value to all of his clients. We repeatedly set record prices and establish benchmarks for other to follow wherever our clients live. Look over our sales history. This is how we earn our fees. Why not have the best negotiator watching your back? Success leave clues. Who you hire absolutely matters!